The Koala Bear is usually recognised by its fluffy little body and cute innocent looking face. Native to Australia it resides only in certain areas of Australia. The Koala Bear is not really a bear, but believed to be confused as one by the European settlers in the late 1800’s. The koala resides in Southern Australia up and along the east coast of Australia as far north as Cape York peninsula. The Koala’s from the south are generally much larger than those in the North. They tend to have thicker coats of fur to keep them warm in the cool winters. The Queensland koalas have a tendency to be smaller with less fur. The staple diet of the Koala is Eucalyptus leaves that may grow in the tall gum trees of Australia or low lying Eucalyptus plants. There are lots of different varieties of Eucalyptus of that only several will the koala feed . The leaves are tough to chew, high in fibre and low in protein. Along with a reduced metabolic rate the koala must conserve energy and does this by waking to 19 hours a day. When awake 3 of the 5 hours are spent eating. Koalas communicate with bellowing to each other and although appear to be a docile creature, they can be very vicious. They have sharp teeth and claws that aid in climbing and chewing the tough diet they need. Rarely do they drink water, although can do so if absolutely necessary. Breeding period is during the Australian spring/summer from approximately September to March. A koala can have one pup a year up until around 12 years of age. Gestation is 35 days old, where the small pup is born blind and with no fur. It makes it way to the rear facing pouch where it feeds off the two teats for another 6 months. Babies will make their way out of the pouch about 8 months and cling onto its mother’s back. Sometimes a koala will have off its mother’s stomach. The infant is fully weaned at 12 months. Koalas can hang out with their mom for around 3 years or until another baby is born. Regrettably the koala is in decline, mainly because of urbanisation that has caused the destruction of its habitat. 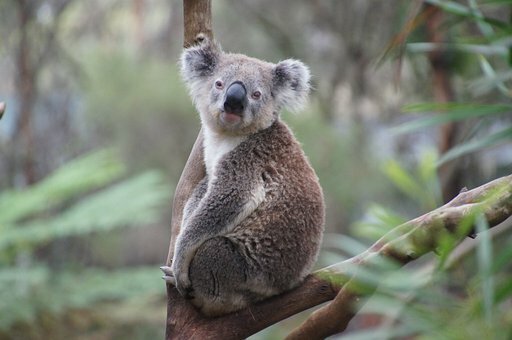 Even though the koala is now recognised as’vulnerable’ by the Australian government, its habitat is not protected.